Laura Dishong, music director at Mary E. Roberts Elementary School, organizes the music trooping presentations. The Art Goes to School program has worked to bring art education to George C. Baker and Mary E. Roberts elementary schools for the past 39 years. Expanding its efforts, the program has also come to include musical elements of art, involving a music trooping lesson that is given annually at two elementary schools. 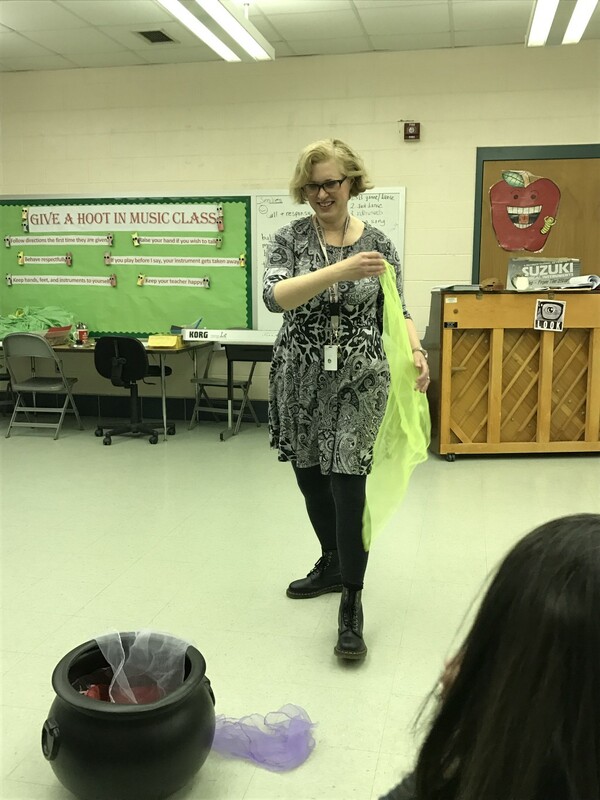 Laura Dishong gives instruction during her music trooping lesson at George C. Baker on Monday, March 6, part of the Art Goes to School program. The music trooping lesson within the AGTS program, which was presented at George C. Baker on Monday, March 6 and at Mary E. Roberts on Monday, March 13, has been in place for more than a decade, and is now run under the direction of Dishong. When she first began teaching at Mary E. Roberts, the AGTS program had partnered with a local pianist who would volunteer her time to visit the schools and play musical selections for their students. She explained that, while some selections of music and corresponding pieces of artwork are easy to identify, others take more time to develop. Although she says the preparation usually takes her a total of 15 hours to complete, she has until March to make the final selections for her presentation. In developing this creative mix, Dishong considers the year and geographical location in which each piece was made, and the mood of the painting. She also tries to find music that not only “fits” with a particular piece of art, but that is also kid-friendly. Furthermore, she believes children are kinesthetic learners and that it is imperative for them to move during periods of instruction to keep them engaged in learning, and thus she seeks to incorporate movement into her lesson plans. “The Art Goes to School music portion is so fun because it brings together artists from different genres and shows the students how these worlds can overlap,” Samantha Ulman, the other district co-chair, added. Examples of art and music trooping pairs Dishong selected this year included the work Cradling Wheat (1938) by Thomas Hart Benton paired with the American folk song “Weevily Wheat”; Clothespin (1976) by Claes Oldenburg paired with “That’s the Way I Like It” by KC and the Sunshine Band; Summertime (1967) by Romare Bearden with “Seabreeze” by Romare Bearden; Café (1940) by William H. Johnson with “Take the A Train” by Duke Ellington; and more. Now that the elementary school’s have Smart Board technology in place, Dishong hopes her music trooping program will be able to add more multi-media activities to its lessons. She also wishes to add video and interactive gaming elements to her presentations as well.